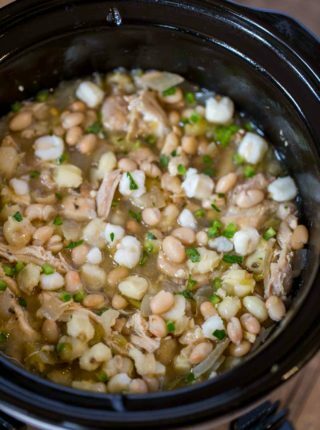 Chili’s Chicken Enchilada Soup copycat is creamy, rich, slightly spicy and thick blended together and topped with chunks of chicken breast meat. 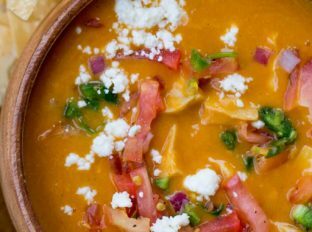 Chicken Enchilada Soup is a delicious, easy soup make with some fun and unique ingredients you’ll love! Unlike most Mexican soups this one doesn’t have a whole bunch of vegetables inside. In fact the only one in there, onions, sort of disappear into the soup as it cooks. It also has a deliciously thick texture that is from something called masa harina. 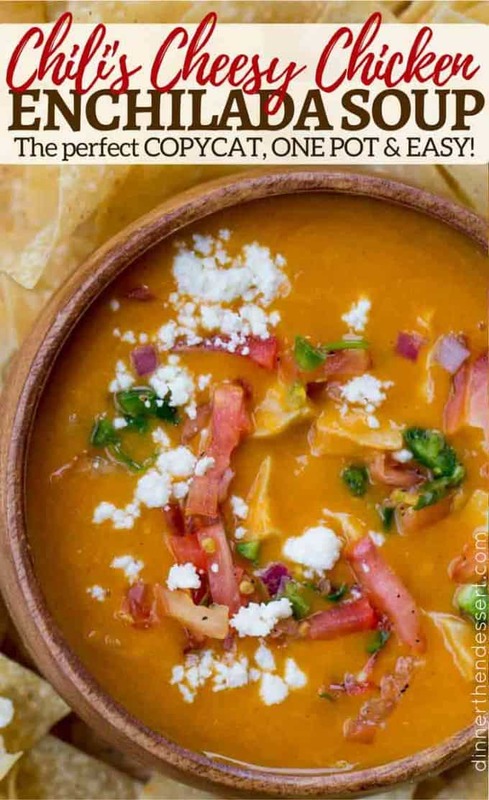 I have a bag of masa harina I love using for a bunch of different recipes, but the use of it in this recipe to thicken the soup is a less expensive and easier way compared to the boiling of ground corn tortillas that more authentic enchilada soups use. If you can’d find the masa harina or if you have corn tortillas and want to use them up, add them to your food processor and process them as finely as you can. They will break down fully in the soup. What is masa harina? Masa harina is made from dried corn which is soaked in lime and water before being ground into flour. It’s commonly used in the making of tortillas. First things first, the original version of the recipe calls for masa harina, which can be difficult to find if you don’t have any ethnic grocers nearby. I buy this one at my local store but a good online version is this one although admittedly more expensive. The original calls for Velveeta but I just don’t use Velveeta as a rule (My only processed cheese habits are Cheez Whiz for Philly Cheesesteaks). I use Better than Bouillon instead of chicken stock and amp up the flavor using more than it calls for on the label. 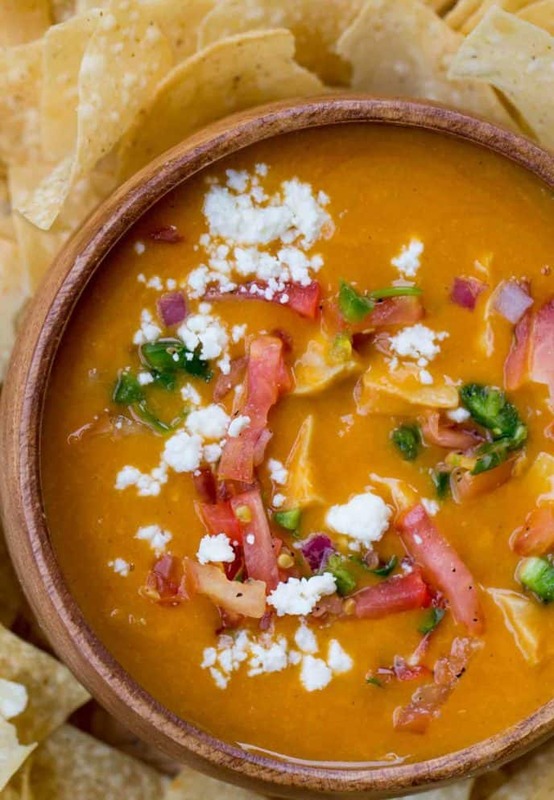 This is an easy way to deepen the flavor of your soup. Add in all the soup ingredients except for the cream cheese and cheddar cheese. Mix really well and cook on low for 7-8 hours (High for 3-4 hours). In the last hour add in the cream cheese, cheddar cheese and stir well. Serve with the toppings as instructed in the recipe below. Dutch Oven: Great for soups or braised meats and the lid is actually a frying pan. 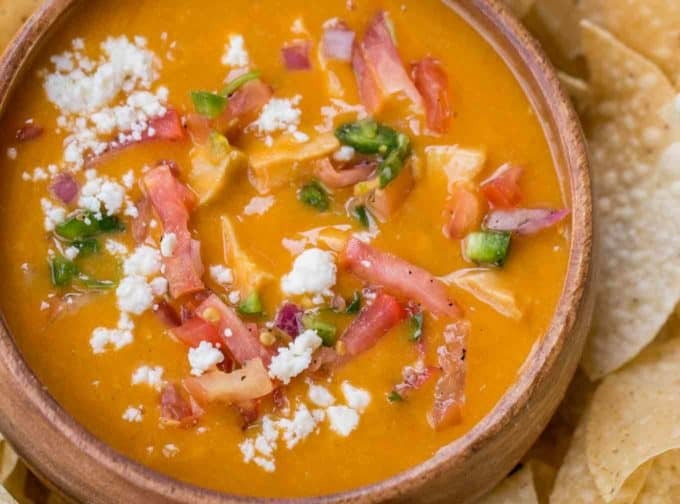 Chili's Chicken Enchilada Soup copycat is creamy, rich, slightly spicy and thick blended together and topped with chunks of chicken breast meat. In a large dutch oven add the canola oil over medium high heat. Add half the kosher salt to the chicken pieces and add them to the dutch oven. Cook the chicken 3-4 minutes on each side, until just cooked through. Remove the chicken and add in the onions and garlic and lower the heat to medium. Add in the spices and cook for 3-4 minutes until translucent. Add in the chicken broth and whisk. In a large bowl add the masa harina to the water and whisk it together well. Add it into the dutch oven along with the enchilada sauce. Add the chicken back in. Stir well and let simmer for 30-40 minutes on low heat. Add in the cream cheese and cheddar cheese and stir well until melted. Add the topping ingredients, except for the cotija cheese into a bowl together and stir. Top the soup with some of the tomato mixture and some crumbled cheese. First off…I didnt have ALL the ingredients needed to make this soup, but I was TOTALLY craving Chili’s Chicken Enchilada soup! SO….I improvised. It was SO good, I practically had a religious experience! Lol. I cut up a rotisserie chicken from Costco and set it aside. Then I sauteed what little fresh onion I had with some dehydrated onion, and added some garlic and parsley paste along with dried cilantro and Cuban seasoning along with the chili powder and cumin. I added the chicken, and about 1/4 of a cube of cream (cheese) all I had and a cup of sour cream, enxhilada sauce, and the chicken stock made with Better than Boullion. I didn’t have Masa Harina, so I took some Fritos and corn chips, added a bit of corn starch, and ground them up in the food processor, and added them in to the soup mixture. I was literally just sort of tossing things in at this point, not really measuring anything. I let it simmer for a bit and then added the cheddar. It was heavenly. It smelled so good, we couldn’t even wait for it to cook and simmer! We just dove right in. It was perfect! 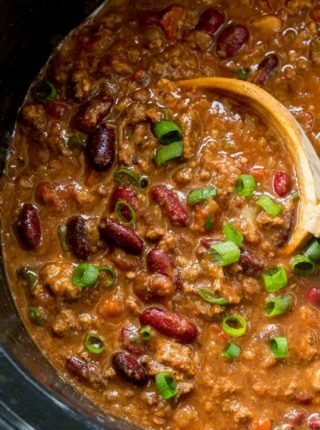 Tastes very much like Chili ‘s version, and is FILLING! Is the perfect level of spice, and makes a considerable amount of soup…..enough to feed a family of 4 adult eaters. I love your creativity! I’m so glad you enjoyed it. I followed the recipe using exact measurements, and was shocked at how bland and tasteless it was. The cream cheese never completely blended and looked like little pebbles, even after I followed your advice from another post and cut it into small cubes before adding it to the pot, stirring with a whisk. So it was pizza night for us, and about $10 worth of ingredients went down the disposal. I’m so sorry. It sounds like your cream cheese was too cold when you added it and that didn’t allow it to breakdown and mix properly. You can always increase the measurements of the seasonings to match more of your liking. Hope this helps! Can I use heavy whipping cream instead of cream cheese? Some people in the household do not like cream cheese. It won’t be as thick but yes, you can use that instead. I hope you enjoy it! I can’t believe people still use canola oil. Don’t you know that it is poisonous?? All normal vegetable oils are bad but canola is the worst. Use coconut oil instead. You’d have to drink canola oil in massive quantities (think multiple 55 gallon drums) for it (the “Poison” you are referring to) to even make you sick. Quit spreading rumors without facts to back them up. You’ll be fine using any oil you want. But so you know, coconut oil is in fact a worse choice than canola oil in any recipe as it contains MASSIVE amounts of saturated fat, more than even butter! Thank goodness someone finally pointed that out. This soup is delicious! I accidentally use the hot version of enchilada sauce and it was too spicy, but other than that it was great. I’m so glad you enjoyed it! Thanks for the 5 stars! Very flavorful and its a thicker soup that can suffice as a meal. I couldn’t find masa harina so I substituted corn flour but it made for a grittier texture. Still delicious but try to find the real stuff if possible! Does this recipe use Cheez Wiz or Velveeta? It states the original recipe uses Velveeta, but neither cheese is listed on the actual recipe. I didn’t use either for this recipe. I used cream cheese and sharp cheddar instead of Velveeta. I hope you enjoy it! How much velveeta did the original recipe call for? Sorry, I use velveeta occasionally for recipes! ? It calls for 16 oz cubed Velveeta. There’s no mention of what stage I add the chicken back into the mixture. I added it before the simmering stage, but wanted to know for sure. Thanks! You did it right! Thanks for catching that! Hope you enjoyed it! When do I add the garlic??? So sorry about that! Must have had a glitch in the recipe card. You’ll want to add the garlic in with the onions. I had trouble getting the cream cheese to completely melt. Any ideas as to why? I cooked in slow cooker and had on high for the last hour. Still was very good. Hmm, maybe they needed to be cut into smaller cubes to fully melt. Glad to hear it was still very good! I had the same issue also in the crockpot. And I did cut it in small chunks. I’m gonna try it in the stove next time and I’ll see if it’s better. I made this as written and it’s delicious! Thank you for sharing. You’re welcome! Thanks for dropping by to let me know! I’m so glad you guys enjoyed it! I have made it twice and will again this week for guests. It is now my favorite soup, knocking down chicken tortilla to second place. The article calls for Cheese Wiz, but the directions do not say anything about cheese Wiz. What do I do?? I was just stating that the original calls for Velveeta but I don’t use Velveeta as a rule. I do use Cheez Whiz for Philly Cheesesteaks (another recipe). Sorry for the confusion. I do not own a Dutch Oven. Will it deplete the integrity of the recipe if I just use crockpot?? Putting it in a slow cooker will be fine. Just add in all the soup ingredients except for the cream cheese and cheddar cheese. Mix really well and cook on low for 7-8 hours (High for 3-4 hours). In the last hour add in the cream cheese, cheddar cheese and stir well. Serve with the toppings as instructed in the recipe. I hope you enjoy it! I love soup season! This looks so good! 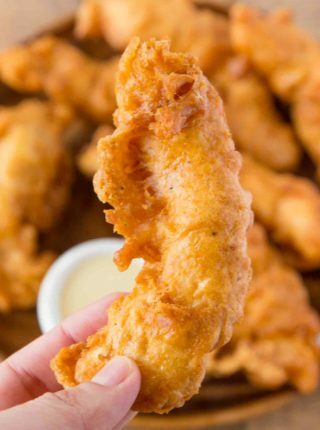 This looks so warm and delicious! Perfect dinner since it’s so cold outside! 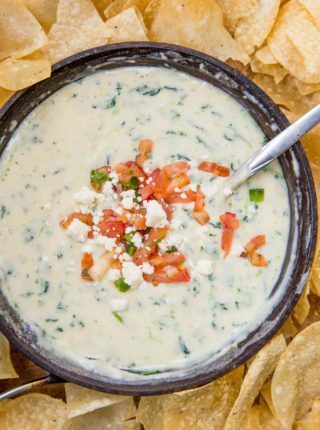 I would love a bowl of this right about now. I love eating at Chili’s and I’m all for anything comforting this time of year! Thanks for another great copycat! 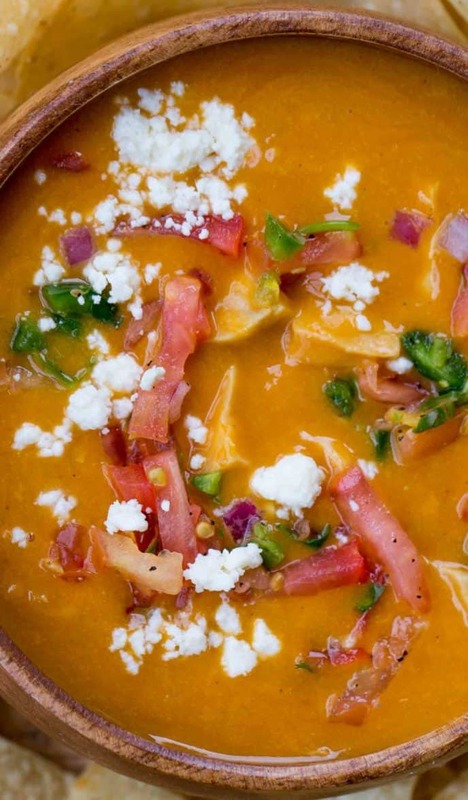 This one of my family’s favorite soups — looks delicious! This soup looks really yummy and perfect for a bread bowl!